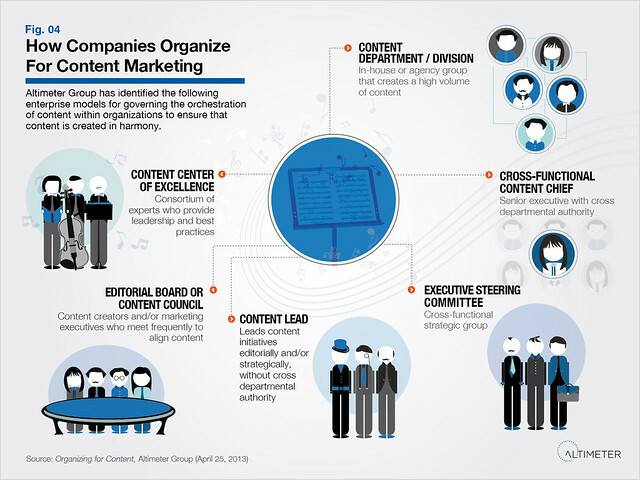 When San Mateo, Calif.-based Altimeter Group interviewed 130 social strategists at companies including Dell, IBM, GE, and Curata, over half of those surveyed said that content marketing was the top go-to-market priority for 2013. Content is no longer just words: In the early days of content marketing, companies might have a blog and a Twitter feed. Now they’re creating content that incorporates video, infographics, and more, plus their content must be optimized for a variety of devices including tablets and smartphones. Emerging platforms such as augmented reality and Google Glass may inform content strategy in the near future. Control of content is fragmented across an organization: Customer service might handle customer care on Facebook and Twitter, while HR manages the Facebook careers channel and PR/corporate communications manages accounts on Tumblr, Instagram, and Google+. Only nine of the brands interviewed have hired staff specifically to handle content (such as an editor or content manager). This fragmentation can create inconsistent messages or overlapping efforts that waste time and money. Hiring a cross-functional content chief with cross-departmental authority. In all of these potential scenarios, the bottom line is clear: companies need a scalable way to meet the increasing content demands of having a digital presence. As these findings point out, “feeding the content beast” by producing a steady stream of fresh, relevant content is an ongoing challenge for marketers, who are often limited by time and money. Curated content–that is, finding, sharing, and organizing outside links that position your brand as an industry thought leader–allows brands to keep satisfying the beast while creating their own quality content. Content marketers looking for effective content curation and creation strategies can download the eBook: How to Feed the Content Beast (without getting eaten alive). Your turn! How is your organization set up to meet the growing content needs of having a digital presence? What content strategies have you found to be most efficient? Jessie Coan was director of marketing at Curata. She brought over 10 years of marketing expertise, passion and creativity to the Curata team. Prior to joining Curata, Jessie served as the Producer at Rival Marketing where she managed all the agency accounts. Before that, Jessie worked with the creative services team at VistaPrint. Jessie earned her B.S. in Studio Art and Marketing from Skidmore College, and her MA in Integrated Marketing Communications from Emerson College.